When I was young I dreamed that one day I would see Angkor Wat in Cambodia, the Potala Palace in Lhasa & the Great Wall of China. I have seen the first two, and the last of my dreams, seeing the Great Wall of China, finally came true at last in May this year. My business partner, Rob, & I arrived in Beijing on 29th April. It was the beginning of China's 'Golden Week', a week-long May Day public holiday. If you do not like massive crowds it is best to avoid the Golden Week, but if you want to see & experience the atmosphere of public holidays for the people of China you will have a unique experience - maybe no city in the world can compare to the celebratory spirit of the Chinese people. Beijing has a new, efficient & friendly airport. The old military uniforms & oppressive atmosphere have now been replaced with white shirts and friendly & helpful immigration staff. There is even a selection of buttons on each counter for you to press after your passport is stamped to rate the quality of service of the immigration officer. The light flashed to remind me to make my choice - I pressed the 'happy' button. We checked in at the 4* Grand View Garden hotel. 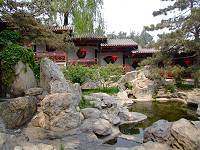 This is quite a unique hotel because it is built next to a famous garden which was part of the 'Red Mansion' dating back to the Ming dynasty. 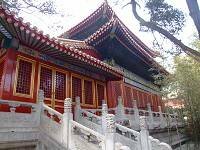 The famous story 'The Dream of the Red Chamber' which made into many Chinese operatic films is based on the history of this mansion & garden. We are using this hotel for our clients staying in the superior hotel category - entry to the garden is free by showing your hotel pass card. 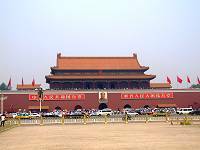 After check-in we headed off to the famous Tiananmen Square. This is a good starting point for any visit to the Chinese capital. 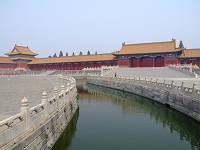 It is a vast space, the Forbidden city to the North, and the Chairman Mao Mausoleum & the memorial of Dr. Sun Yat Sen on other sides. It is the symbolic centre of the Chinese universe. It is in this square that you are most likely to see the Red Guards. They march & change guard under the clicking digital cameras of the tourists. Before we saw the Forbidden City our guide took us to the Dr.Sun Yat Sen Park that is hidden on the left hand side of the main gate to the Forbidden City. Because it was Sunday the park was full of local Chinese families enjoying themselves & taking photographs for their family albums among beautiful Wisterias & Azaleas. We walked through these lovely surroundings to a Chinese restaurant in the park for our lunch, a meal of sweet & sour pork, fried beef, fried aubergine, a large bowl of soup & rice. This is a normal kind of lunch for two. Sometimes there may be an extra meat dish or vegetable dish. We have many clients who are vegetarians who should not be worry about coming to China - the vegetable dishes are very varied, our fried aubergine was the most memorable dish of our lunch. After lunch we entered the Forbidden City. The high & imposing gate & the walls towered in front of us like a protective armour. I, like many hundreds of other visitors, felt small in the courtyard awaiting entry to a secret world about to reveal its history to us all. The first thing I noticed was that the door was so huge I felt like a child in an adult world. This is the Meridian Gate (Wu Men). Beyond this huge door is the dark & deep archway coming out to the first sight of this hidden ancient city of palaces. The massive courtyard in front of us can hold up to 10,000 people. At the far end of it is the Supreme Harmony Gate (Taihe Men). Across the 5 marble bridges over the Golden River we came to face the Three Great Halls - the Hall of Supreme Harmony, the Hall of Middle Harmony & the Hall of Preserving Harmony. These halls were used for ceremonial occasions, coronations, the Emperor's birthday and so on. Beyond these lie a similar, smaller but more important (in terms of real power) group of buildings. 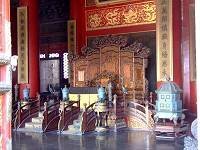 The first is the Palace of Heavenly Purity, the actual residence of the Ming Emperors. Beyond this come layer after layer of walls & buildings until finally you reach the Imperial Garden and the North Gate of the Forbidden City. It is a long walk through many wonderful imperial buildings with golden yellow roofs, marble archways, steps & bridges, watched over by stone dragons, lions & tortoises in this vast secretive pleasure palace a world away from the common people outside. 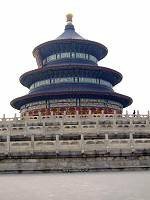 We walked out of the North gate & got back into the car to head for the Temple of Heaven. This famous building is a circular temple hall mounted on a three-tiered marble terrace. This magnificent structure is the Hall of Prayer for Good Harvests. It has the very best architecture of any building that I have ever seen. The materials & the colours of the building are beautiful & indeed heavenly. The decorative paintings on the outside as well as inside of the building are rich & wonderful. The gold & blue colours of the roof & the top of the building looking like heaven and the red & yellow on the lower part of the building representing the earth. It is stunningly beautiful building. Nearby there are also the Round Altar & the Echo Wall where many local Chinese try to get an echo by shouting at the wall at one part & listening at the other side of the wall. There is also a stone path near the center where you can hear the echo of clapping from your hands. Close your eyes & listen among the other visitors hand-clapping at the same time.